Chimpanzees are found in the tropical forests of western and central Africa, from Gambia in the west to Uganda in the east. Adult males can grow up to six feet tall and can weigh up to 154 lb. Females are smaller and weigh up to 116 lb. Their arms are longer than their legs, and they usually walk using all four limbs (knuckle-walking). Coloration varies from brown to black, and the hair around the face grays as they get older. Some chimpanzees even go bald in old age, especially females. Although chimpanzees are lighter than humans, they are five to six times stronger than humans because of their stronger muscles. There are three subspecies (all endangered): the central chimpanzee (P. t. troglodytes) found in Central Africa, the western chimpanzee (P. t. verus) found in west-central Africa, and the eastern chimpanzee (P. t. schweinfurthi) found in east-central Africa. Chimpanzees are found in a variety of habitats, such as open savanna woodland, grasslands, and rainforests. 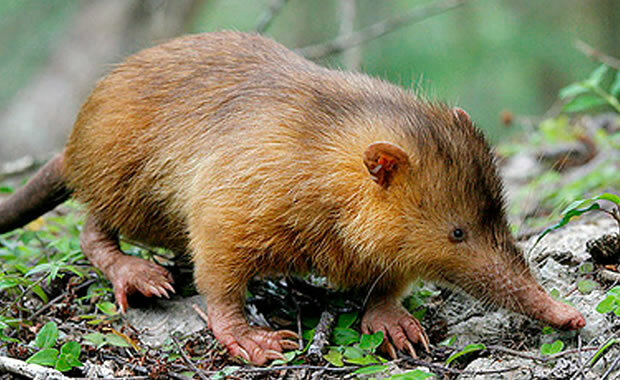 They are very social animals and live in communities with 20 to 100 individuals. They are active mainly in the day and sleep in nests that they build in the trees at night. 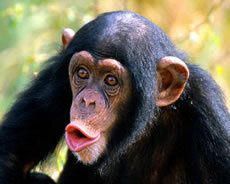 Chimpanzees are omnivorous and feed on fruit, leaves, flowers, seeds, insects, and bird eggs. They are also known for their organized hunting of small animals like leopard cubs and monkeys for their meat. Breeding occurs year round, and females give birth to usually one (sometimes two) offspring after a gestation period of 202 to 260 days. The exact population of chimpanzees in the wild is unknown, but experts believe that there may be 190,000 left in the wild as of 2008. Threats to the species include habitat destruction due to human expansion, hunting, and commercial trapping for the animal trade. Chimpanzees have been studied for over 30 years and have been the focus of conservation activities both nationally and internationally. Some chimpanzees can be found in protected areas, such as national parks. Copyright Notice: This article is licensed under the GNU Free Documentation License. It uses material from the Wikipedia article "Common chimpanzee". Glenn, C. R. 2006. "Earth's Endangered Creatures - Chimpanzee Facts" (Online). Accessed 4/24/2019 at http://earthsendangered.com/profile.asp?sp=70&ID=1.